Step into the enchanted world of Broadway’s modern classic, Disney’s Beauty and the Beast, an international sensation that has played to over 35 million people worldwide in 13 countries. This “tale as old as time” is filled with spectacular costume and beautiful sets. 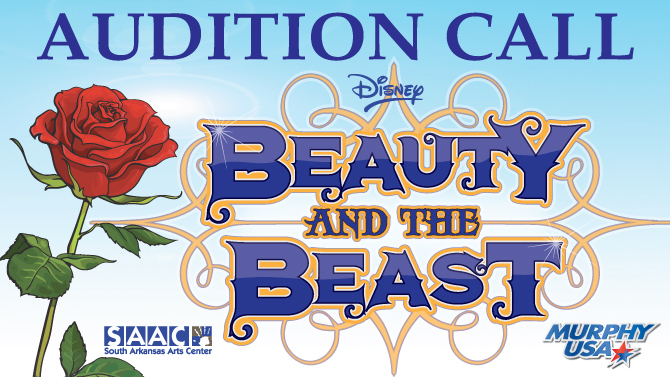 Disney’s Beauty and the Beast will bring the entire community together for family theatre at its best. Seeking large cast of all ages, heights, physical types, and performance levels. BEGINNERS ARE ENCOURAGED TO AUDITION!! Expect a musical theatre style of dancing and singing. 1. Prepare a song selection from any Broadway Musical. Be prepared to sing the full song. The song does not have to be memorized and you may use sheet music. 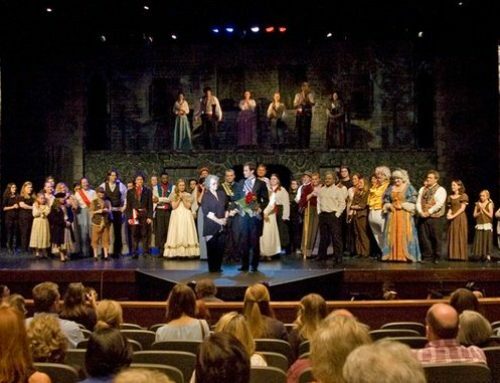 Performing Arts Department Head for Camp Lindenmere in Henryville, Penn., and has taught master classes in Musical Theatre and Dance all over the United States. 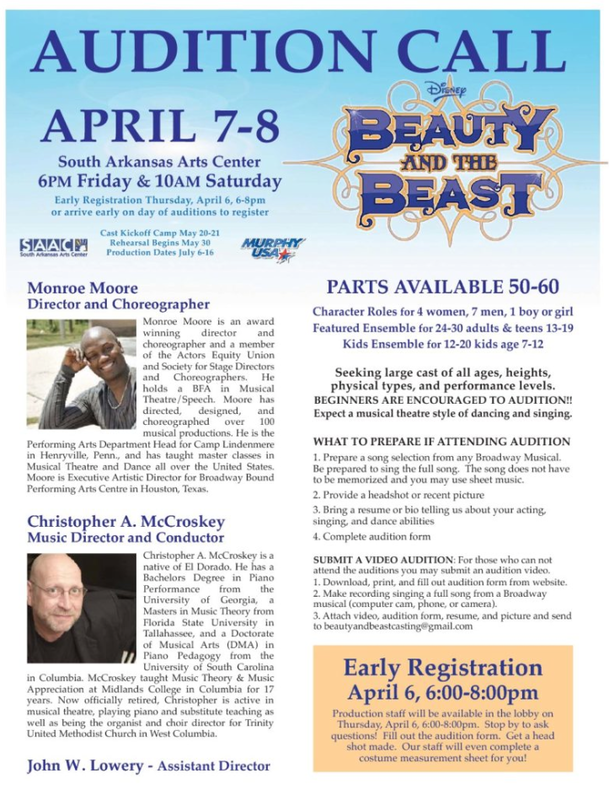 Moore is Executive Artistic Director for Broadway Bound Performing Arts Centre in Houston, Texas. in Columbia. McCroskey taught Music Theory & Music Appreciation at Midlands College in Columbia for 17 years. 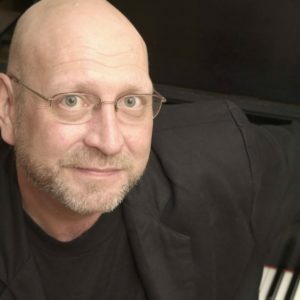 Now officially retired, Christopher is active in musical theatre, playing piano and substitute teaching as well as being the organist and choir director for Trinity United Methodist Church in West Columbia. One rainy night on the threshold of the castle a beggar comes and asks vain and narcissistic owner of it a shelter overnight, in which he denies her. In retaliation for this, she enchants him along with all the inhabitants of the castle. He becomes a terrible monster, and the others – household goods and utensils. In addition, witch gives him a magic rose, after falling off the last petal of which, he will always be a monster if only up to this moment he finds the girl whom he could love and who would love him in return. 10 years later, local girl named Belle, which differs with phenomenal beauty, and being an intelligent and well-read, romantic nature, sends her dad-inventor on the fair-exhibition, with his next invention. He becomes entangled in the forests and his horse is frightened by wolves on the rainy night; they turn to the same castle where they meet enchanted inhabitants. 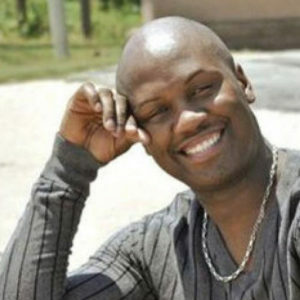 The owner of the castle orders to throw him into the prison as a trespasser. His daughter runs after him to seek and to find him imprisoned, dealing a contract with a monster that she will be there for him, not hers father. In the evening, she did not come to dinner with a monster and they swear. Then, as she still experience hunger, she was fed by the households, against the orders of the host to starve her to death. Meanwhile, back in the city there is a brave heart that is in love with her, wants to go on her quest. Some time later, Belle had a tour on the castle, and she saw a fading rose. She almost touched it, but the Beast ousted her from the lock, then having a huge pity about his anger, understanding that will forever remain a monster without her love. During her escape from the castle, she is attacked by flock of wolves and Beast beats them, defending Belle from the pack. She leads him wounded to the castle, washing his injuries. They start from the friendship and Beast becomes in love with her, about what he wants to tell her during their personal ball dance. But she longs for her father and the magic mirror shows that he is in the forest, surrounded by the pack of wolves. She runs to his aid, finds him, carries him home, where a crowd of people burst in, led by her unanswered lover who wants to put her father in a madhouse, for what she said that he had been kidnapped by a monster. Using a magic mirror, Belle shows everyone that the Beast exists, but in vain, because now they all want to kill this terrible creature and go to his castle. Lover of Belle breaks into the castle, the rest of the crowd remained, and they fight to the death with the Beast. Although the man fell to his death, he mortally wounded the creature and now Belle mourns the loss of latter. And, before the fall of the last petal, she tells him that she loves him. He suddenly transformed into a man and becomes alive and they kiss with Belle, as the curse is broken. Everyone else is also turned into people and going to the ball.